There is one meeting room on the second floor that seats approximately 30 people. 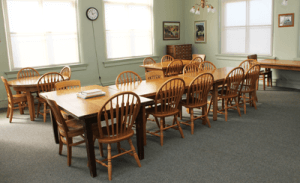 If a group wants to use the library for a meeting outside regular library hours, there is a two-hour limit for the meeting, and no meeting will last later than 9 p.m. Evening meetings can only be scheduled from Mondays through Thursdays. Reservations are made on a first-come, first-served basis and must be received at least 7 days prior to the date needed. If the reservation needs to be canceled, this should be done at least 24 hours in advance of the meeting. Reservations may not be made for a meeting more than 3 months in advance.